The age-old skillet comes in so many variations, choosing one can be a bit overwhelming. 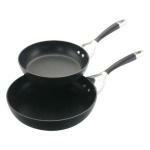 But evaluating a pan based on several simple criteria can make your decision more straightforward. First off is material. 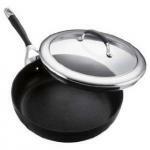 High-end makers have distinguished themselves by creating skillets made of specialized metal alloys. These alloys are extremely good at distributing heat, ensuring that you don’t get any “hot spots” when cooking. Aside from these fancy materials, other popular choices include stainless steel, cast iron and various types of nonstick surfaces. Size and shape are two other important factors to evaluate. A larger pan ensures you’ve got enough room to maneuver food items, but also can be heavy, harder to store and more susceptible to hot spots. As far as shape goes, a circular pan is a more traditional choice and works well for sauteing and stirring liquid sauces. A square skillet, though, will be better for grilling sandwiches and other rectangular foods, as it optimizes the amount of space you can use in the pan. Finally, some cooks like to have a grill pan on hand, a specialized skillet that includes indentations on the surface for keeping grease off of the surface of the food. All-Clad's 13" Stainless Steel French Skillet features three-ply construction and a stay-cool handle of cast stainless steel. Safe at temperatures as high as 500 degrees Fahrenheit, this pan can even be used in the oven -- all parts are metal. 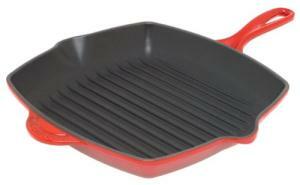 Mauviel offers a 10 1/2 inch frying pan featuring sloped sides for greater control over temperature and handling. 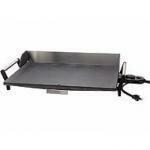 The pan is made for high heat frying, aided by 2.5 mm thick copper and its ability to conduct heat. This neat stovetop griddle will help you painlessly create not just breakfast foods, but sandwiches and meat items with ease. Convenient stovetop grilling is now at hand. The LTD line from All-Clad stands out because of the striking black hard-anodized exteriors. They resist scratching, peeling and chipping. The new cast aluminum cookware by Fagor is induction ready, which allows a high degree of savings and efficiency when combined with use of an induction cooktop, yet it can be used on any cooktop.